Picturing Disney: Spring Break Share-a-thon Giveaway! Since I am on an extended Spring Break (we didn't use all of our snow days this year) I thought it would be fun to run a contest to give us a big push for 2,000 Facebook Fans! There will be TWO prizes and it is super easy to enter! 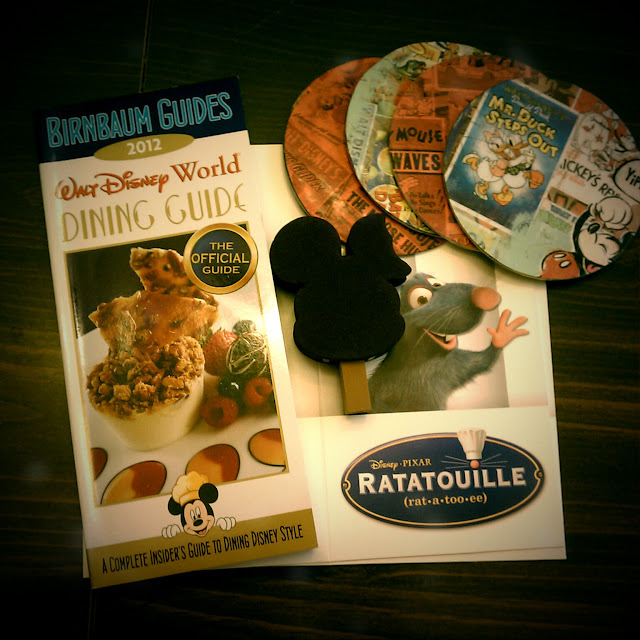 This will include a copy of Birnbaum's Walt Disney World Dining Guide 2012, a Mickey Premium Ice Cream Bar antenna topper, a set of 4 Ratatouille chef hats, a Ratatouille keychain and the coasters I made for the Chip & Co Disney DIY article on repurposing favorite disney maps and mementos! To Enter: Share any of our pictures or articles through the Facebook page. Each share is a new entry. Additionally you will be entered if you share the page with your friends and they come and like us. All they have to do is mention you in a wall post on the Facebook page! And, another chance to win another great prize is easy as pie! This will include a copy of Passporter's Walt Disney World 2012! This is a great value and as you will see Passporters are so much more than a guidebook! To Enter: All have to do is "Like" Picturing Disney on Facebook! I will randomly select a winner of this from all the Picturing Disney Facebook Fans on April 10th! Sharing and love Picturing Disney!